About three weeks ago I saw somebody riding a bike in the bike lane on Madison! All joking aside the traffic flows better and is more humane but I am not impressed by the biker use. Did you also notice that white stuff on the ground? The number of bicyclists will probably increase after the whole route is completed. Right now, it only goes from Partridge to Allen. Meaning, it's not that great and people won't go out of their way to bike on a street whose path is only a few blocks long. I was very negative about the road diet when it was announced but I really love it and am excited to see it continue all the way to Lark. I eat my words! I've been a big fan of the changes so far. The congestion along the busy restaurant section is seemingly much more organized and, well, calm. The pace of the road seems a bit slower, but then again it also feels much more consistent which makes traffic conditions extremely more predictable for drivers, pedestrians and bikers alike. Looking forward to Phase II. I really like that I don't have to worry about someone deciding to turn left at the last minute, and the buffer of the bike lanes allow me to see available street parking easier. I am very happy overall with the road diet. However it has had a significant impact on rush hour traffic heading West on Madison. At the Intersection with Western, where it goes back to two lanes, very few cars are using the left lane to go straight which almost halves the number of cars that go through the intersection with each signal change. This causes traffic at peak times to back up for multiple blocks. I thought people would adjust to it and learn to use both lanes, but this hasn't been the case. Not sure what else can be done. I usually detour to Western Ave now to avoid the backup on Madison. but obviously that takes extra time also. 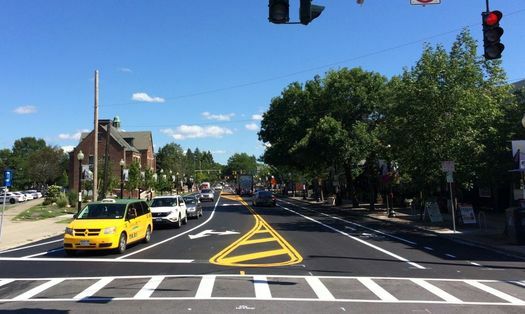 @Albanylandlord : The backup at that intersection existed before the road-diet as well. People are reluctant to use that lane because if you get one car turning left in front of you, you are almost guaranteed to not make it through the current green light. If anything, I'd say the road-diet does a better job of highlighting the fact that that is a frequent turn-lane. As a multi-modal user of this corridor, I think this has been a very positive change, with benefits to all, especially those who bike or walk (which I primarily do). I did clock my average time to drive down this stretch for several weeks before and have done so several times since the road diet was instituted and have noticed little to no change. Visually, I feel like the change causes me to join backed up traffic further down from Allen than I did in the past, but temporally, it has taken me about the same time to drive from Partridge to Allen, as it did before the road diet. End of day, back ups are a feature of this crowded corridor, and the road diet hasn't done anything to improve or make them worse. Hopefully they will consider getting rid of "beg buttons" for pedestrians on this stretch. They waste time, discourage walking, encourage jaywalking, don't work in the snow, and are difficult for people with disabilities! I was a big fan before the change happened. Now that it's here, I hate it. It is a constant morning traffic jam on Madison ave. My co-workers feel the same and frequently comment n it And, for the record, we all live in Albany. I'm really dissappointed in the whole thing. I don't like the road diet. The two times I drive on the road it's busy. I drive at peak times - why is everyone driving at the same time I am? I don't like to get hotel rooms. I like to buy a place where I am traveling, and then pay the for the heat, taxes, mortgage on the 363 days I'm not there. Madison avenue can be one lane in each direction for 23.5 hours a day; safer for drivers, pedestrians, cyclists and transit riders. But for the 30 minutes a day I need it it should be 4 lanes wide. And 65mph. Without traffic lights. Because that's efficient. For me. The road diet is a huge success from my perspective as a motorist and a pedestrian. I *cannot wait* for it to run all the way to Lark, where I use Madison daily. In a perfect world, it would run all the way to South Swan, ending in a wonderful left-turn lane onto Swan. Really the only drawback to the entire program was the lame funneling of two lanes into one around St Rose while we waited for phase two to begin. Which road is next in line for a diet?!? ?